This section is created for users, who don't know or just not sure how to activate RipTiger in the right way. 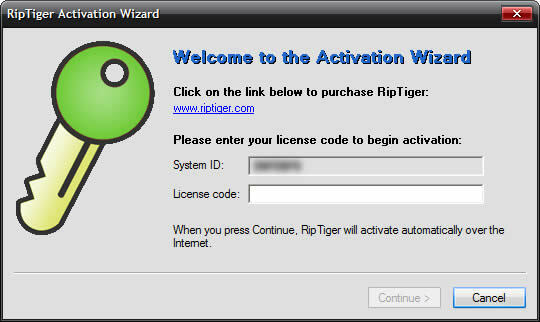 RipTiger license code is sent to you in the confirmation e-mail after the purchase is complete. To activate RipTiger, please install and run the trial version. Besides the main program window you will see the additional window with "Buy Now" invitation. At the bottom of this window there is an "Enter License Code" button. Please click on it and you will see the "License Code" window. Input your license code and click “OK”. You will receive your activation code. In case you’re unable to get the activation code automatically, please click on the link in the “License code” window and try to get RipTiger activation code manually. You will be directed to the official RipTiger site. Please fill in the product form in order to get an activation code. If you don’t have Internet connection or any other activation problems occur, please send your PC System ID (you can see it in "License Code" window) to RipTiger support team (support@riptiger.com) and we will send an activation code to you by e-mail.